Anybody cook steak in a skillet? I tried something I've never done before over the weekend. I took a cast iron skillet out to the side burner on my grill (15,000 btu) and got it as hot as I could. Threw some sea salt in and a little pepper. Put the steak on top of that for 3 minutes each side. I thought it came out pretty good. Anyone else ever try this? I was thinking about trying again, but just going one minute each side then finishing on the grill. do it all the time, same as how they do it a outback. Really sears the flavor in. I dash with season salt, let it warm to room temp, sear both sides on cast iron griddle, then finish in convection oven. A good sear is crucial for a good steak. Same with thick center cut pork chops. Nothing sears a steak (tuna or beef) like a super hot cast iron skillet. yes, it is the best way to do it. I usually do it 2 minutes on each side, then put a slice of butter on it and throw it in the oven for another couple of minutes. have always done Tuna this way with a little olive oil. That brings up my next question. When I tried the steak, I coated the skillet with some extra virgin olive oil because I was afraid it would stick. Is this necessary? I take about a tablespoon of Cajun blackened steak rub and a 1/2 cup of Merlot and heat it in the pan. Reduce it down til it's about like a sauce consistency, turn up the heat for a few minutes and throw in the steaks. Sear them on both sides to desired color, then reduce heat and finish meat to however you like it......rare, medium rare etc. That brings up my next question. When I tried the steak, I coated the skillet with some extra virgin olive oil because I was afraid it would stick. Is this necessary? No, not in a good seasoned cast iron skillet, at least that is my experience. If you want to add oil I would do-so by wiping the pan down with a papertowel dipped in oil to put a very light coat on. Olive oil burns easily. Avacado oil holds up better to heat. Butter also holds up well to heat. I've never done this but I am going to try it one night this week. in went the cast iron pan for 30 min. then in went the rib eyes. close the door and gave them 4 min per side then pulled the pan out , man were they ever good. when the steaks cooked in the pan, the wood smoke gave them such a good flavor. and let them sizzle in their own juice. way different taste than just letting them grill over wood. Skillet is OK for a light sear, but not a hard char as I like it. I need my grill's ceramic "searing" burner on high for that. If you are going to use olive oil, don't use extra virgin. Its flash point is much lower than regular olive oil. I use clarified butter, a trick taught to me by the head chef at the Angus Barn in Raleigh. I have a cast iron grilling skillet, I use it cause its a pain to drag out the grill and have to clean it afterwords. I do okay with it, but I never get an amazing steak with it. I swear I prefer a flame to touch the meat and impart some flavor. I did some porkchops last time though and they came out great. Thanks, I was going to skip lunch but seeing those damn steaks in the skillet ruined that. I think thereis a frozen dinner in the freezer here at work. Mmmmmmm not. A good sear is crucial for a good steak. Same with thick center cut pork chops. Actually, that has been disproven, especially for steaks that have been frozen, but ti still tastes good. I prefer the grill but there is nothing wrong with pan searing a steak or even a pork chop. Leave the Pepper off while cooking .Burnt pepper gives a bitter taste,pepper at the table. 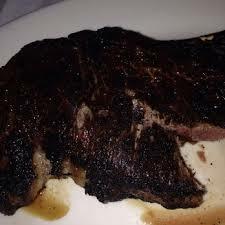 I don't have a problem with Olive oil,I rub it on the steak not the pan, then salt/season but no Pepper. As said a well seasoned pan and a well marbled cut will make its own grease and not stick,a lean cut will need a little oil.